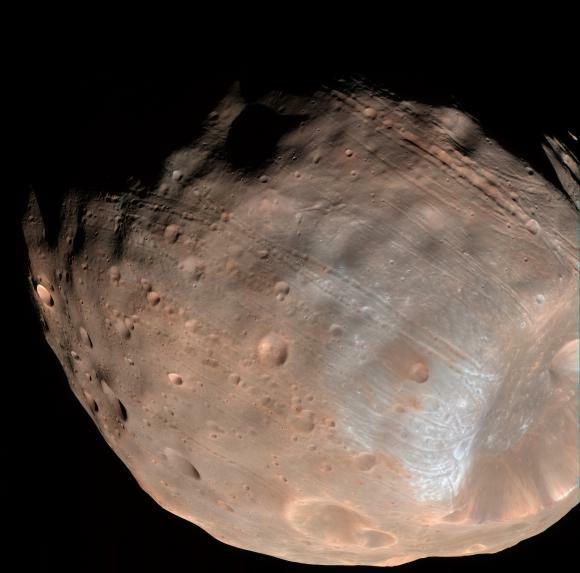 Although rocks of volcanic origin are the most common type on Mars, complex sedimentary sequences do occur, often with enormous thickness and lateral extent. Arabia Terra, in particular, hosts several large craters with extensive outcrops of sedimentary or sedimentary-like rocks (Malin and Edgett, 2000). The sedimentary rocks in this area are thought to be very old and some date back to the Noachian Era (from about 4.6 to about 3.7 billion years ago). Image 1: Perspective view of Crommelin central bulge. The image is centered at about 350° E, 5° N. The image consists of a mosaic of Mars Reconnaissance Orbiter (MRO) Context (CTX) images (P01_001401_1846_XI_04N010W, P02_002021_1848_XI_04N010W, P02_001876_1852_XI_05N010W, P06_003432_1852_XI_05N009W) draped over High Resolution Stereo Camera (HRSC) Stereo-derived Digital Elevation Model obtained from Mars Express (MEX) orbits: 2108, 3253, 3264, 5091. The width of the scene is about 50 km. The perspective view is north-pointing (see image 3). Vertical exaggeration is 2x. Image 1 is a perspective view of the 100 km diameter Crommelin Crater (~ 350° E, 5° N). The crater has one of the most spectacular exposures of layered rocks outside the Valles Marineris canyon system (Lucchitta, 1992). It is located in Arabia Terra, east of the chaotic terrains and outflow channels (Image 2). It is also relatively close to Meridiani Planum, where the Mars Exploration Rover (MER) Opportunity landed. Image 2: Location map: Crommelin crater is located in Western Arabia Terra on Mars. 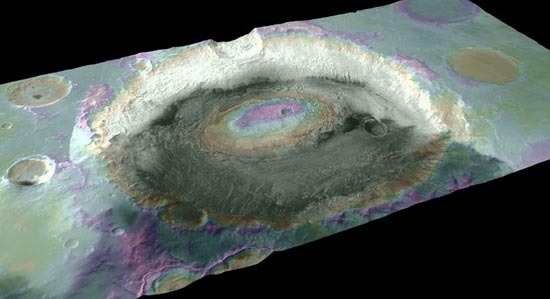 The background is a color-coded shaded relief map obtained from Mars Global Surveyor (MGS) Mars Orbiter Laser Altimeter (MOLA). 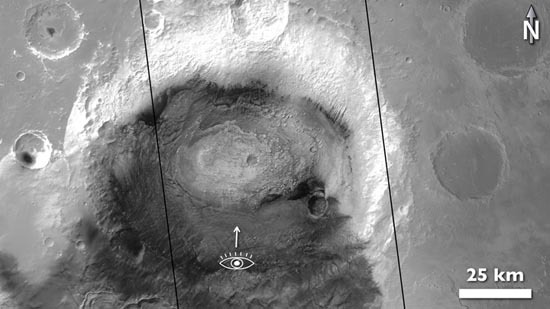 Given its size, it is curious that there is no central peak in the otherwise pristine impact crater. 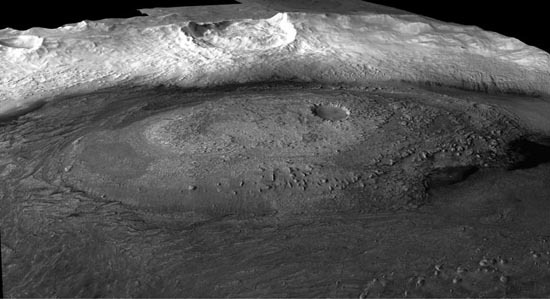 Rather, the location is masked by an extensive cover of layered material, elliptical in shape, located both on the crater floor and especially on the central bulge. This bulge is about 50 km wide. The maximum exposed thickness of the layered deposits is about 1,500 meters. The stratigraphy of the deposits appears to be complex: most of the layers are sub-horizontal, with some local variations. Extensive erosion affects these deposits, likely due to wind action as large-scale wind streaks are visible in the surrounding area (Image 3). The material(s) which constitutes the layered sequences appears to be more easily eroded than the typical plateau bedrock in the area and the Crommelin structure itself does not appear as degraded as the mound (Image 4). Image 3: Location of the CTX mosaic (between the 2 black solid lines) and indication of the viewpoint for the perspective in Image 1 (HRSC nadir band (panchromatic) mosaic from MEX orbits 2108, 3253, 3264, 5091). Layered rocks occupy both Crommelin and its neighbor crater just South of it. Crommelin Crater is about 100 km in diameter. The origin of these deposits is still under discussion. 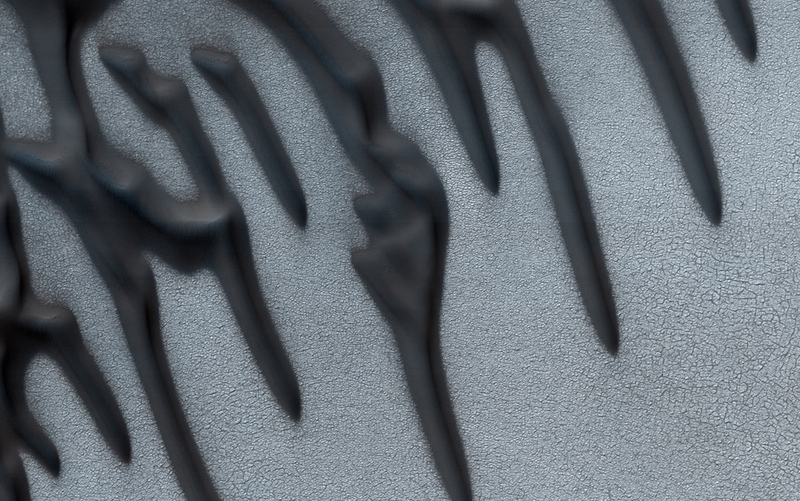 They could be formed as water-laid sediments of various origin: e.g. lacustrine or spring-related. They could also be related, to some extent, to eolian deposition. Also, a non-sedimentary origin can not be excluded at this point. In addition, their age is difficult to constrain, as the amount of erosion makes the use of crater counting techniques difficult. Further insight into the genesis of these sedimentary-looking deposits will be provided through instrument targeting exercises by current missions and perhaps even by future Lander/Rover missions. Image 4: Perspective view of an elevation color-coded HRSC nadir mosaic (orbits 2108, 3253, 3264, 5091). 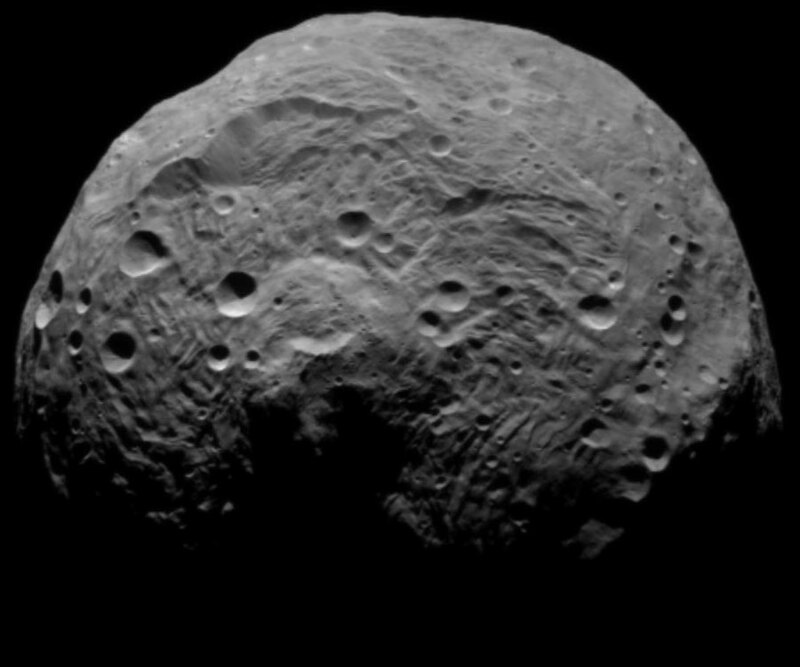 The central Bulge is almost as high as the crater rim. North is towards the upper-left corner of the picture. Crommelin Crater is about 100 km in diameter. Lucchitta, B. K., et al. (1992), The canyon system on Mars, in Mars, edited by H. Kiefer et al., The University of Arizona Press, Tucson, pp. 453-492.